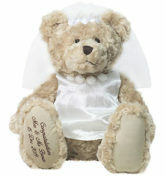 Our My Wedding Teddy bears include a beautiful Bride and Groom. 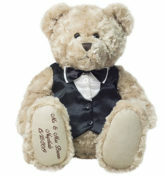 These teddies will make any wedding even more special and are a fun and beautiful keepsake. The name of the happy couple can be embroidered on to the paw of the teddies, along with the wedding date – always remembered. Click below for more details.